Say hello to the dress of the season. This gorgeous metallic knitted dress is perfect for all events this party season. 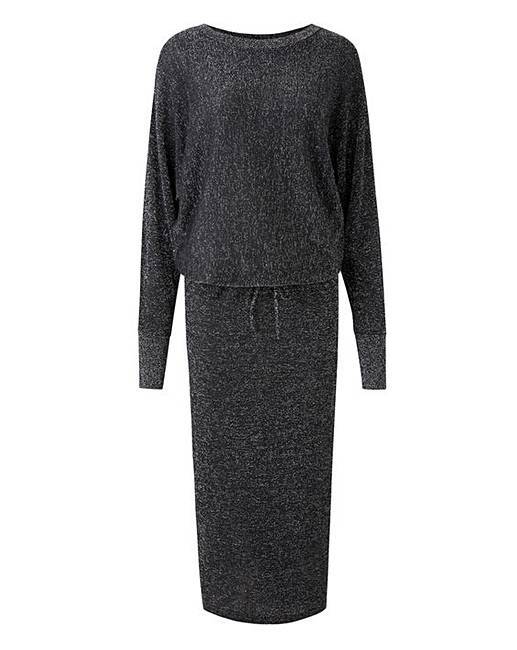 Featuring a tie waistband for extra comfort, batwing sleeves and made in a stunning metallic knit. Be the star of any party and pair with your favourite heels for a gorgeous evening look! How to create the 2-in-1 look of this dress as shown on our model: We suggest trying the dress on and then pulling the dress up so that the draw cord channel at the waist sits just above your waist line. Pull in any excess with the draw cords for a comfortable fit and tie the draw cords. You can then blouson the top of the dress over the draw cord at the waist. This will then give the look as it is shown on our model.